It's the closest thing to a minivan that's not a minivan. The Honda Pilot has rightly earned its reputation for excellent build quality and reliability ever since the first generation hit the market for 2003. Currently in its third generation, launched for 2016, the Pilot is once again a quality benchmark (what current Honda isn’t?) and it may just be the most minivan-like in the three-row crossover segment. For starters, it almost looks like a minivan from many angles. While the new Chevrolet Traverse prides itself for its SUV-like exterior appearance, the Pilot definitely has more of a “bubbly” look going on. Those who already drive a minivan likely won’t mind this, but we can see how many other potential buyers would. However, that minivan-like exterior translates into minivan-like interior space. Until the new Volkswagen Atlas and latest Traverse arrived on the scene, the Pilot was one of the segment’s interior volume leaders. Despite the fresh competition, the Pilot still offers an impressive 109 cubic feet of cargo space with both the second and third rows folded flat. The Chrysler Pacifica minivan, by contrast, offers 140.5 cubic feet with its passenger seats flattened. The Chevrolet Traverse also has a maximum cargo volume of 98.5 cubic feet. So yeah, the Pilot is plenty big and it even has a certain trump card its competitors can’t match: seating for up to eight passengers thanks to a third-row seat that can fit three. To achieve this, the Elite trim only second-row captain’s chairs are gone in favor of the standard bench seat, which can also fit three. If there’s one thing Honda has always done well, its powerful engines, and the Pilot is no exception. All Pilots come standard with a direct-injected i-VTEC 3.5-liter V6, rated at 280 hp and 262 lb-ft of torque. A six-speed automatic is standard in the LX, EX, and EX-L models, while a ZF nine-speed auto is solely for the two top trim levels, Touring and Elite. All-wheel drive is optional ($1,900) on all trims except for the Elite where it comes standard. 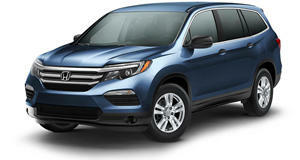 Although it weighs a hefty 4,302 pounds, Honda still managed to shave off some 300 pounds compared to the previous generation Pilot. It’s also larger than its predecessor in overall length and height. But does this (somewhat) lighter weight translate into a better driving experience? Kind of. Despite its respectable engine output and 0-60 mph time of 6.1 seconds, which is good for a crossover this size, the Pilot still drives like the large vehicle it is. The electrically assisted steering is tuned towards the lighter side, meaning all is just fine when driving on a straight highway, but curvy roads are not particularly enjoyable. Then again, people don’t buy a Pilot for the twisty mountain road driving experience. Fortunately, Honda engineers also beefed up the Pilot’s suspension and shock-absorbers so that it doesn’t feel like you’re riding in a school bus. Inside, the general dashboard layout is nice and straightforward with the 8-inch touchscreen front and center. However, this is not the best touchscreen system out there. It’s simply frustrating to work with at times. For example, the volume controls are integrated into the touchscreen, as opposed to traditional (and far more functional) knobs. Even with the Pilot’s smooth as butter ride, it’s easy to tap the wrong button for basic functions that shouldn’t require any difficulty. As with all Hondas, interior quality is top notch with lots of soft touch surfaces. Head and legroom is in abundance and even a couple of full-size adults will find the third row comfortable for short hauls. When it comes to safety, there’s the optional and recommended Honda Sensing, a suite of technologies focusing on collision avoidance. Like the Chrysler Pacifica, and all other three-row crossovers for that matter, the Honda Pilot is not exactly cheap. A base Pilot LX with FWD and 8-passenger seating begins at $30,900, while a fully loaded Pilot Elite with AWD and that nine-speed automatic will deplete your bank account by around $50,000. It’s worth noting that the Acura MDX, which rides on the same platform as the Pilot and has a more powerful version of its 3.5-liter V6, has a $44,000 starting price. Even if you were to tack on Acura’s excellent Super-Handling AWD system, an MDX would still cost about the same as the fully-loaded Pilot. Given that, it’s kind of hard to find value in the Pilot, despite it being an excellent vehicle overall. However, the MDX does not offer seating for up to eight, only seven. One other vital factor that must be mentioned is the . It too begins at around $30,000, has standard seating for eight, it comes standard with the same V6 engine and nine-speed automatic. It’s also . So why opt for the Pilot over the Odyssey? Let’s face it: minivans aren’t as stylish. Узнайте про полезный сайт , он описывает в статьях про лазерная эпиляция в киеве.